When you are Being Here in the current moment…magic happens. Years of resentments dissolve, true love blossoms where it’s least expected, and ordinary moments become extraordinary. 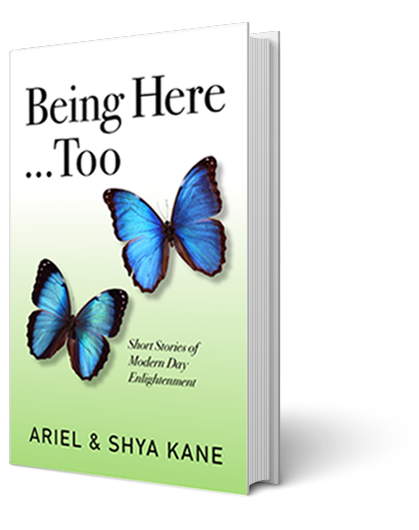 Award-winning authors Ariel and Shya Kane, along with folks from their international community, share inspiring true stories about life, death and everything in between. These heartwarming personal tales will allow you to enjoy the magic of Being Here…Too. A sequel to Being Here, Modern Day Tales of Enlightenment, this book illustrates how life can be easy and will support you if you let it. Your day-to-day experience of living can literally transform so that accomplishments come naturally and things you have strived to change dissolve all on their own. From Brooklyn and Kansas City to Zurich and Hong Kong, join storytellers from around the world and spark Instantaneous Transformation in your own life. The greatest wisdom teachers in history have used the story to reach hearts and minds. 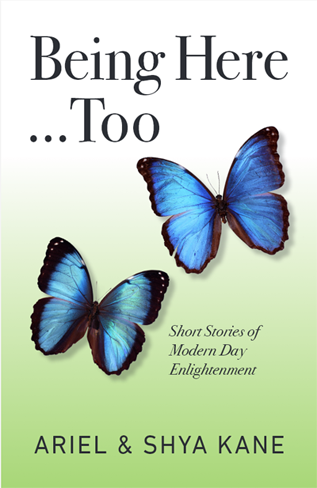 Being Here...Too advances the tradition of educating, uplifting, and healing through sharing the human experience. These real stories by real people demonstrate that we all have the capacity to open, shine, and watch the universe work miracles through us and around us. Top kudos to Ariel and Shya Kane and friends for a golden gift that touches us where we live. These stories were exactly what I needed to read to get outside of my own noisy head. I highly recommend that you open this book with an open mind and let the magic happen. Being Here...Too turns the concept of being here now into a practical reality that each of us can have for ourselves. ...Such a fun book to read. The individual stories made it easy to understand the simplicity of enlightenment, particularly when I read the chapter “The Search for a Better Me”. Get special offers about Being Here…Too!